Designation: Assistant Professor at University of Osijek, Croatia. Research Interest: cereals, malt (barley and wheat) quality, beer production and beer quality, mycotoxins, Fusarium spp., fermentations, alcoholic beverages, aroma determination, volatile compounds, food biotechnology, food safety and traditional biotechnology. Biography: Graduation paper in Food toxicology: „Suppression of accumulation of group B trichothecenes in grains infected by Fusarium graminearum“ (2008) determined the future course of her scientific activity as she continued to research mycotoxins in malt and beer. 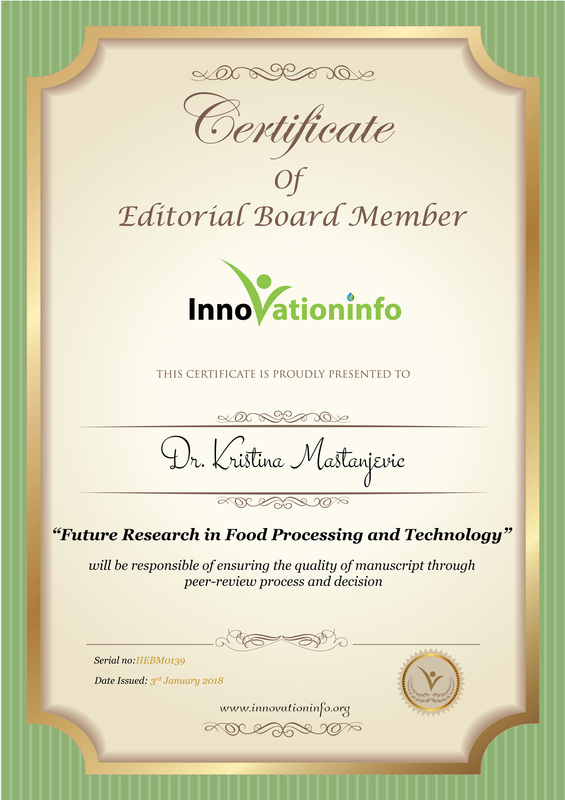 Finishing up her graduation studies in 2008, she started to volunteer at Faculty of food technology on a project “Improvement of food safety in production and processing of cereals” (2007-2013), under leadership of prof. Vinko Krstanovi?. In February 2009 she got a job on the same project and started to work as a teaching assistant for prof. Krstanovi?. She got her PhD titled: “The impact of molds from genus Fusarium on mycotoxicological quality of wheat, wheat malt and beer” in January 2015. In March 2017 she got a position as an assistant professor at the University of Osijek, Faculty of Food Technology.